I hope you all had a great Valentines Day and a great weekend. This is what I wore for our Valentines dinner at home. I got these shoes in the mail just in time for Valentines day and I have worn them everyday. I am obsessed with the color for spring. I have been planning my outfits around these shoes! Matt is off today for presidents day! I love it when he has a day off during the week. Today we are spending the day shopping for a few things for our condo. We moved in a few months ago but there was so much that we needed to get that we couldn't do it all at once. So today we are going to get the last few things. I am also going to paint our bedroom. I have the color picked out so we are going to get all the supplies. I don't know why but I love running errands and shopping with Matt. It is one of my favorite things to do! Love this look! Those heels and distressed denim are amazing! I'm so in love with your heels, they are adorable! Love this outfit so much! Those heels are adorable. Would love to know how comfortable they are? I love that shirt with those shoes! I can’t believe that it’s on sale. Thanks for sharing! Love this look! The shades of pink are so pretty! I love the light shades of pink, pastel pink is lovely. And those shoes are so pretty. Adorable outfit! That pair of denim is fab :) always stunning Jade!! In awe of those shoes! Thanks for sharing! What an incredibly cute and girly outfit!!!! 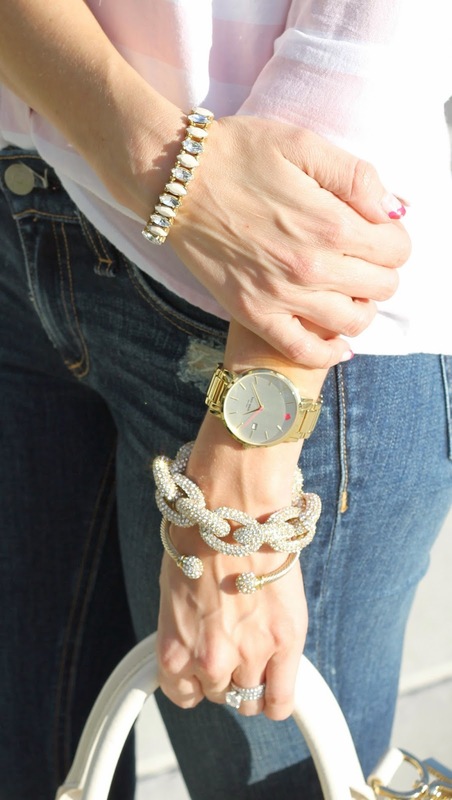 Also, do you get worried that stacking bracelets beside your watch will scratch the watch?! I love the look but I'm always hesitant to do it because I don't want to ruin my MK! I love those shoes!!! So cute! I can't say love enough to express how much I love these colors together! Excellent look. I love the casual feel of this outfit, and the shoes are AH-MAZING! The striped top and pink heels are great feminine touches to balance out the ripped jeans! I love this outfit, especially that bag!